Aerial photograph of Caillou Lake Headlands “aka Whiskey Island” Restoration taken on July 21, 2017. The restoration of Whiskey Island is located along the south central coastline of Louisiana and is being constructed with funds from the settlement of the Deepwater Horizon oil spill. Coastal Engineering Consultants led a team of consultant companies for the design of the restoration project and is providing construction administration services during construction. 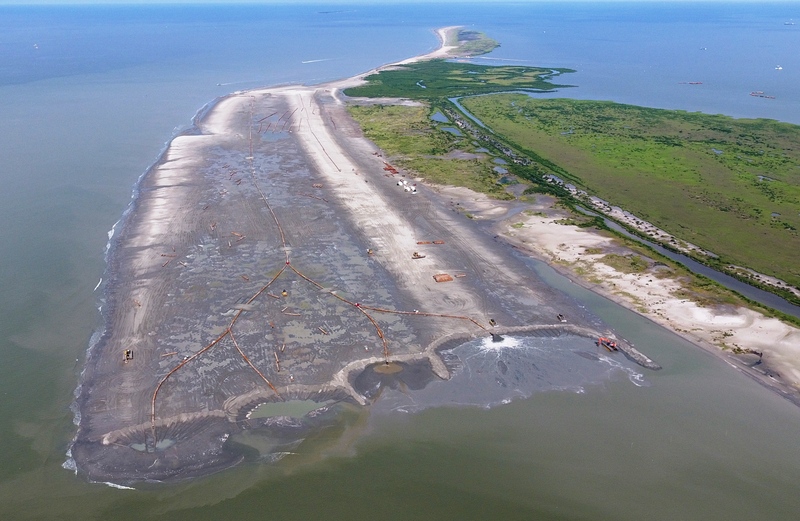 The overall restoration will require 10,100,000 cubic yards of sediments to restore over 930 acres of habitat. The beach and dune template at the point of discharge shown in the aerial photograph is over 1,000ft in width. At the time of the photo the Construction Contractor, Great Lakes Dredge and Dock Company, has place nearly 2,000,000 cubic yards to create what is shown. Aerial photo courtesy of Great Lakes Dredge and Dock Company, LLC.